Wood, clinkerbuilt construction – the first to be built. There can’t be many of these left now. Mark 1 – still a common site, recognisable by the timber cockpit coamings. Mark 2, early – grp superstructure moulding. Mark 2, late – similar, but more headroom in the cabin. Mark 3 – similar again, some small changes to the deck moulding. Corribee, junk rigged – the same superstructure as the standard Corribee. Coromandel – junk rigged, but with a different cabin moulding. Start at the bow and work backwards…. Bow roller fitting – should have a strap extending down the stem of the hull. If it hasn’t it needs modifying, as it takes the upward load of the forestay. Roller reefing gear – check it’s not seized up. Usually easy to dismantle and recondition, but you might have to (get someone to) make some new bits like bushes or bearings. Anchor locker (if there is one) should have a small drain hole at the very bottom. If there’s water sloshing about in there it can leak through the bulkhead, which is a piece of glassed-in plywood. Mast step – should be flat, not dished inwards. If it’s dished, suspect the ply backing pads underneath, probably wet and rotten. Can be replaced with a bit of work. Check inside the cabin to ensure the mast beam is sound. Base of mast – check for corrosion around the base. It’s usually possible to saw off the bottom inch or two if it’s badly corroded, and refit the step fitting. Guard rail stanchions – if they’ve been pulled about they might be leaking at the base. Easy to fix. Chain plates (shroud u-bolts) and surrounding deck area – again, should be flat. If bulging upwards, the rigging has been overtensioned. Fix by glassing in a new and stronger backing pad inside. See below for details of repair work. Bilge keels – look for cracks where they join the hull. If it looks anything less than perfect then the keels have been subjected to a lot of stress. This is probably the most difficult problem to sort out (not impossible, but could be a 2 man job). I’ve not seen a Corribee with this problem. Windows – leaking seals are common, and usually the fixings in the aluminium frames are corroded. If you’re careful the frames can be rescued, and with new fixings, seals and some Sikaflex can be restored. Rudder post – has been known to leak at the base, usually the result of the rudder being knocked or grounded. Easy to fix, provided you’re out of the water….. 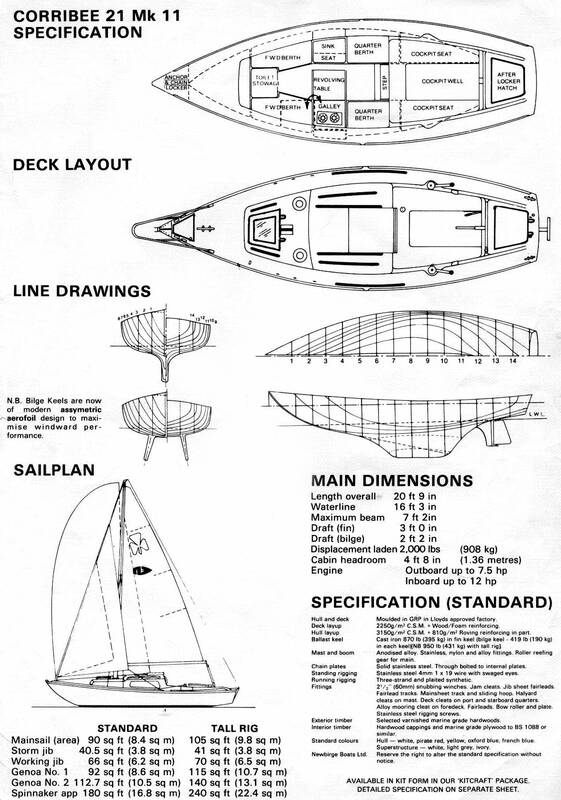 Rudder – a skeg is good. Some earlier mk 2’s have had them fitted, and they are standard on later versions. If there is no skeg, check the fitting at the top of the rudder post to make sure the rudder can’t drop out. Jackstay fixings on the stern deck – as for chain plates, check they haven’t been pulled upwards by an over-enthusiastic rigger. Don’t get carried away with all the inventory (radio, depth sounder, cooker, galley fittings etc) as they aren’t very important. These things can be bought at boat jumbles. The most expensive items are the mast and boom, so if they need replacing expect a massive bill. Repairs on the hull and deck are labour intensive but DIY’able. If you can use an angle grinder and work with epoxy resin and glass mat you can tackle most or all of the common problems. If you’re looking at one with an inboard engine (BMW or Vire) then discount the value of the engine itself -it’s obsolete, maybe unreliable and spares/ repair will be a problem. If it has a newish Yanmar then that is a bonus. Spend a weekend looking at every Corribee you can find, whether for sale or not. When you’ve seen a few you’ll easily recognise a nice clean straght example. I’ve not mentioned a lot of obvious things – standing and running rigging, exterior woodwork etc, as its easy to tell if it’s up to snuff, and easy to replace if it’s not.